Although women are the most common clients, microblading is becoming a popular trend amongst men. Microblading on men is usually done with subtle effects, while creating a fuller brow, or better shaped brows. For men who want more fullness in their eyebrows, or patches filled or touched up, microblading is a great option. Some men prefer a bold look, while others simply want to feel better about their naturally patchy or unevenly shaped brows, and the solution to their problems is microblading. 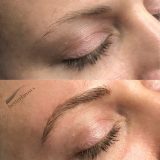 Microblading is a process where small blades create tiny superficial cuts, the size and shape of an eyebrow hair, in and along the eyebrow, which is followed by a deposit of pigment, delete this line it is different pigment than regular tattoos, to give the colored effect of a real eyebrow hair. The microblading procedure is essentially a tattoo of hairs that mirror the position and configuration of your real hair follicles. Yearly maintenance retouching is required by the microblading technician to keep your brows looking great. It will save time in the bathroom every day, as well as any dissatisfaction you may have felt from having to apply fillers or pencils every day to look how you want to look. Visiting your microblading technician is a two appointment process. When you arrive, your technician will run through what you are looking to achieve and draw the brows to the perfect shape for the preferred result. Once you are happy with the outline, the process will begin. It’s a relatively painless procedure that feels like plucking or threading of your brows. You will lay on a bed, the technician will begin creating tiny cuts in your skin, which is what will be your new hair lines. Once the lines are etched into the skin a pigment will be added to the cuts, they create the darkened hair line effect. This pigment is pre-mixed to color match your natural brow hair color. Through the process, your microblading technician will show you the progress and discuss whether more lines are needed, or additional areas touched up. After 6 weeks you will come back for a touchup appointment to perfect any spots that need more pigment. The results last between one to two years depending on your skin type, however after six weeks you need to return for a touch up (which is included in the price). To ensure your microbladed eyebrows last as long as possible, research and find a technician with a proven track record and see examples of their work. Microbladed eyebrows might not be for life, but they are semi-permanent, which means they will be on your face for at least a year, so you want to make sure they are perfect.